45,000 people across the US died last year from overdosing on drugs and medications. More than 42,000 of those overdose deaths were from opiates. That means there are more opioid related deaths than those from car accidents and gun violence combined. 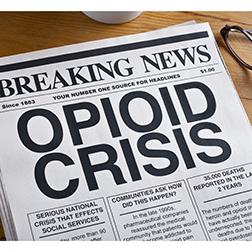 CHI St. Alexius Emergency and Trauma Center Director Dr. Jon Solberg adds, "The US uses 80 percent of the world's opiates and we only have five percent of the population, so this has become a huge problem in the last 10 years." Doctor Solberg works in the ER at CHI St. Alexius. He shared that he tended to three to four overdoses himself last week. This doesn't include patients other doctors saw. And the opioid crisis has come full circle for hospitals nationwide. Solberg explains, "Street drug use is starting as prescription drugs and progressing into illicit drugs as time goes on." A Drug Enforcement Agent shared a graph with us, showing a steep rise in Heroin usage in the Bismarck-Mandan area since 2015. We won't show his face and disguised his voice because of the nature of his job. The agent says, "We've had to make a conscious effort to target opiates because we're seeing so many overdoses, and we're seeing the real danger to our community lies in these drugs." There are a lot more synthetic opiates on the market today versus ten years ago. Heroin is five times the strength of Morphine, but the latest drug, Fentanyl is 50 to 100 times the strength of Morphine, and Carfentanil is 10 to 100,000 times more powerful. The agent adds, "I think we're finding about an equal mix across the board. But they're all opiates, whether they're synthetic or actual, they're all the same effect on people and they're being abused the same way." The agent says, "When it comes to the addiction of opioids, it's truly an epidemic. We're seeing it in all walks of life and everywhere, and the addiction is so powerful, people can't escape it." The agent says the problem started in the early 2000's when the pharmaceutical companies sold doctors on these pain medications and the idea that patients should not endure any pain. There was a four-fold increase in pain medication prescriptions following this push. Dr. Solberg says the medical community is working hard to back-track the opioid crisis.